IQS Directory provides an extensive list of temperature transducer manufacturers and suppliers. Utilize our website to review and source temperature transducer manufacturers with our easy-to-use features which allow you to locate temperature transducer companies that will design, engineer, and manufacture temperature transducers for your exact specifications. Our request for quote forms make it easy to connect with leading temperature transducer manufacturers. View company profiles, website links, locations, phone number, product videos, customer reviews, product specific news articles and other production information. We are a leading manufacturer directory who will connect you with the right manufacturers whether you are looking for high temperature pressure transducers, temperature pressure transducers or fluid temperature transducers. Siemens Process Instrumentation is an ISO 9001 certified manufacturer specializing in liquid level sensors and temperature transducers. This includes how they are designed and manufactured. Since our foundation, we have built an extensive line and are experts in using the products for virtually any function. For all your needs, be sure to contact us for a quote on your next project. There are a number of advantages you will receive if you rely on us to design your temperature transducers. We use very creative means to manufacture our products and we always push the savings down to our customers. You just need to let us know your application and we can handle the rest. We are your one-stop-shop for all things involving transducers. Our components can be designed with value-added features. Since 1980, KOBOLD has been a leader in the research, development and manufacture of high quality pressure transducers, gauges, sensors and transmitters. Our reliable products obtain accurate measurements for flow, pressure, level and temperature readings. Though our line is broad, some of our products include rotating vane flowmeters, temperature transducers, ultrasonic sensors and much more. Temperature transducers are devices that change an input of energy into a temperature reading. Transmitters/sensors are composed of transducers, and the terms are frequently used interchangeably. Transducers, however, can convert a form of energy into another form while sensors always convert energy into a readable display. 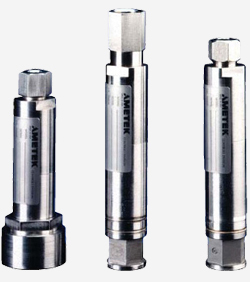 Other kinds of transducers measure torque while others communicate air pressure. Temperature transducers translate energy from pressure or from the temperature itself and use it to produce a measurement, displayed on a gauge, dial or display. These devices take temperature readings by either coming into direct contact with a substance or by evaluating its infrared energy. Depending on the kind, temperature transmitters can be housed in a tough stainless steel enclosure and equipped in cooling jackets or air purge assemblies; they are built to withstand the most intense industrial conditions. Transducers in the form of probes have no moving parts that would require maintenance and often consist of two thin metal wires or a flat disc. Other kinds are handheld and encased in plastic. They have a small window that allows the internal sensors to make a reading of infrared energy. Temperature transducers and sensors are used in many industries and processes where heat is present. Typical applications include measuring the temperatures of ceramic materials, metals, plastics, robotics, semiconductors, textiles and glass. Processes like heat treating, printing and petrochemical development are just a few examples of operations in which temperature transducers are useful. There are two main ways that a temperature transducer or transmitter measures thermal energy. Contact temperature transducers physically touch the substance and then measure their own temperature. When thermal equilibrium is achieved, there is no heat flow between the transducer and the substance being measured; the temperatures are the same. They are fairly durable and simple to use. However, the physical contact may contaminate the substance or damage the transducer. Readings require time because thermal equilibrium must be reached. Also, there is an increased potential for incorrect measurements when using contact transducers because it is difficult to accurately measure a flowing liquid. Regardless, they are used to measure solids, liquids and gases. The alternative is to use a non-contact transducer. These devices read temperature by measuring the infrared energy being emitted by an object or substance. Though they cannot measure gas temperature, they are used with solids and liquids. Non-contact transmitters are used to measure temperature when actual contact between the sensor and product would cause contamination or corrosion, when the substance is moving, when the reading must be taken quickly or when the reading must be taken through a window (such as in an explosive environment).